Knowledge for knowledge’s sake is sometimes okay! Writer’s Block – Thinker’s Block? I am struggling to revise the BIG PAPER from last quarter which, as I re-read it, shows just how little I know and just how little I am changing! I am supposed to revise the paper to incorporate new information and ideas from this quarter… and I find that there are so many redundancies that it’s hardly worth the effort. The important pieces have been said. What little CAN be added isn’t really necessary for the conclusions I drew and I don’t know that simply adding “so-and-so agrees, too” is useful. I don’t know that removing the details from before and replacing with new authors is useful, either. I refuse to put in theories that don’t reflect my personal beliefs (and there are many in the books we are reading). All this, while I am trying to get caught up on the other tasks that languished in the last week while I had a migraine. Writing is rapidly ceasing to be fulfilling. And thinking is out of the question. Spring can’t arrive soon enough for me. This was at a fundraiser for a friend’s church. I helped a little. I am very proud of him for wanting to help his friends, and impressed with his guitar playing. First time he had tried this — I hope it won’t be his last! 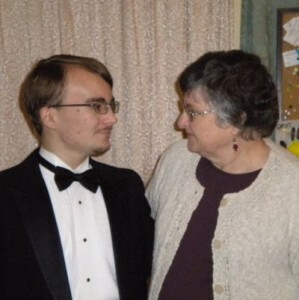 And this is stidkid#1 and his grandmother, who were about to leave for his adjudication the following morning. Handsome fellow, takes after his father! For a month now, I have noticed the catkins on the hazelnut (filbert) bushes in the yard. They have been a bright spot in the landscape. The witchhazel flowers have greeted me as I have gone in and out the front door, and now I notice swelling buds on the red-flowering currants again. I haven’t been out in the actual yard much, but I do see a few bulbs beginning to show green — hyacinths under the medlar, a couple of tulips seem to be trying to show themselves as well. I occasionally hear frogs out in the boggy spots in the back near the cow pasture or in front near the blueberry bushes. The grass is green — so green, and growing quite tall in this, the supposedly dormant season. I am afraid the peach tree may not make it this year — it has not been cold enough to support good growth. It has rained some, but not as much as in a typical year — and except for the brief VERY cold spell in December the winter has been considerably warmer than most years. January is the warmest on record, average highs and lows in Seattle about 6 degrees F above normal. In terms of personal comfort, it has been quite nice. Our heating bill is lower, and I have worn heavy winter gear only a few times. In terms of flora, it may or may not be a good thing, depending on the chill requirements for optimum growth; and with luck it won’t get really cold again, since everything thinks it’s spring already. In terms of fauna, the frogs are singing at the wrong time of the year, and I hear songbirds more often than I expect. In terms of snowpack and summer water, this does not bode well. We need the snow on the mountains to melt slowly in the warm months. I have seen several news reports that the rivers that begin in the glaciers on Mt. Rainier are getting clogged with silt and gravel because the water is flowing when it shouldn’t. The biggest challenge will be whether spring and summer are normal, or warmer than normal like last year, or cooler than normal. Anything could happen.